Golfers from around the world descended on Ajman and the stunning Al Zorah Golf Club earlier this month for the official opening of the Middle East’s newest championship golf course, the first Nicklaus Design layout in the United Arab Emirates, and the first course ever in the Emirate of Ajman. Exactly two years to the day since construction started on the first course in the UAE to open in over six years, the breathtaking par-72 layout created by Nicklaus Design Senior Design Associate Dirk Bouts was officially opened by His Highness Sheikh Humaid bin Rashid Al Nuaimi, Ruler of Ajman, the Emirate located near Dubai. Golfers, high-profile government officials and other VIPs participated in a special opening event, and became the first to play the Troon Golf-managed course, located just 25 minutes from Dubai International Airport. “Ajman represents a new chapter in the Nicklaus Design portfolio, with its first-ever golf course in the United Arab Emirates. Al Zorah Golf Club—set amongst a naturally preserved environment of native sandy areas, lakes and some one million square meters of mangroves—opened its doors in style after months of high-profile media previews. Incorporating 10 par 4s, four par 5s and four par 3s, the course has already exposed golfers to the unique tidal system that changes the proposition of several holes depending on whether they’re played in the morning or afternoon. The course also features two magnificent lakes, including one that plays a prominent part in the standout par-3, 15th hole. 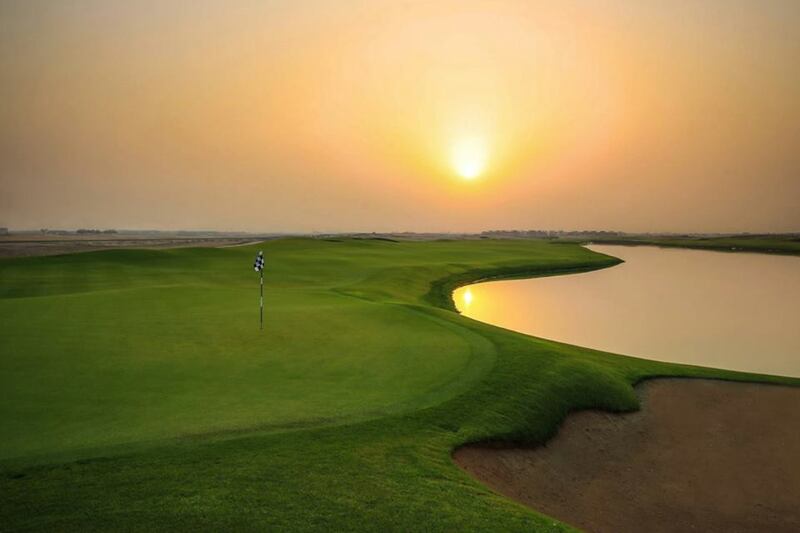 “Over the last two years, a tremendous amount of hard work has gone into ensuring Al Zorah Golf Club is the stunning layout that it is today,” said Philip Henderson, General Manager for Al Zorah Golf Club. “We’d like to thank Troon Golf for its exceptional management support throughout, as well as Nicklaus Design for the incredible job they’ve done in creating a world-class course layout, whilst maintaining the natural environment. Solidere International has also been instrumental in the ongoing development of properties at Al Zorah. In addition to the fascinating golf course, those attending the opening event at Al Zorah Golf Club were welcomed by The Pavilion, an inviting clubhouse which will be replaced by an even more impressive clubhouse in 2017. By the end of next year, golfers will be able to use the first of four marinas planned, as well as the five-star Oberoi Al Zorah Beach Resort. Significantly, the Al Zorah Golf Club site has been designated a Free Hold Zone by the Government of Ajman, meaning the land is not only legal to build on, but also to live on, too. Constructed in conjunction with real estate developer and property manager Solidere International, there are several Al Zorah Golf Villas as part of an initial development, offering a more relaxed way of living amongst natural landscapes and wildlife. For membership enquiries or to book a round at Al Zorah Golf Club, contact Darren King on 800AZGOLF (domestic) or +971-6-70-14-783 (international), or email kingd@alzorahgolfclub.ae. For more information on Al Zorah Golf Club, visit www.alzorahgolfclub.ae.